Pixiv is one of Japan's largest art community. It's somewhat like deviantART but their website looks totally different. Pixiv have their own quarterly magazines and occasionally also publish art book collections. 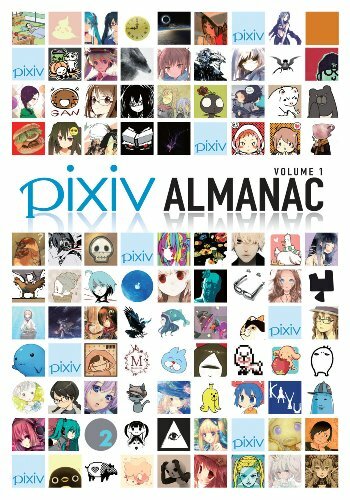 Pixiv Almanac Volume 1 is the English edition of the original Japanese edition pixiv年鑑2010 オフィシャルブック. There is actually a 2009 edition but for some reason, the 2010 edition was chosen to be the volume 1 in English. This paperback is 258 pages as compared to the 272 pages for the Japanese edition. I'm not sure if anything significant is missing. There are almost close to 200 artists featured in the book. It's mainly character art in different anime, manga and CG style. The variety is great except that most are female characters. Hatsune Miku seems like the most popular character and there are many pieces with her. There's only a handful of background art. Most illustrations are quite elaborate and detailed, the simplified anime style is actually rare. Each artist has only 1 to 2 pages of work featured. Some of them are printed smaller than quarter page size which makes it difficult to look at the details. The good thing is the artists' websites are provided so you can check out more of their art online. I'm impressed by the quality of submissions. This book really makes me wonder why deviantART don't have anything similar. It's a great book for those who like Japanese character art. omgahhh!! this book looks sooo amazing. really wanna get my hands on it. thanks for the review! really appreciated it :) and i can't believe i've only just discovered your blog!